There are a lot of different brands available on the market for this product and since I got through them fairly quickly, I have managed to try different ones from various Korean beauty brands (one tub of aloe vera gel can last up to 5-6 months if used scarcely, unlike me). Around the time when I was planning to do this 'Top 5 Uses of Aloe Vera Gel' blog post, I actually ran out of my last tub of aloe vera gel and was actually thinking to get myself a new one. Luckily, I attended the Butterfly Project 4th Birthday Party around the same time and found out that one of the sponsor brands for our goodie bag is the K-Beauty brand, Pax Moly! 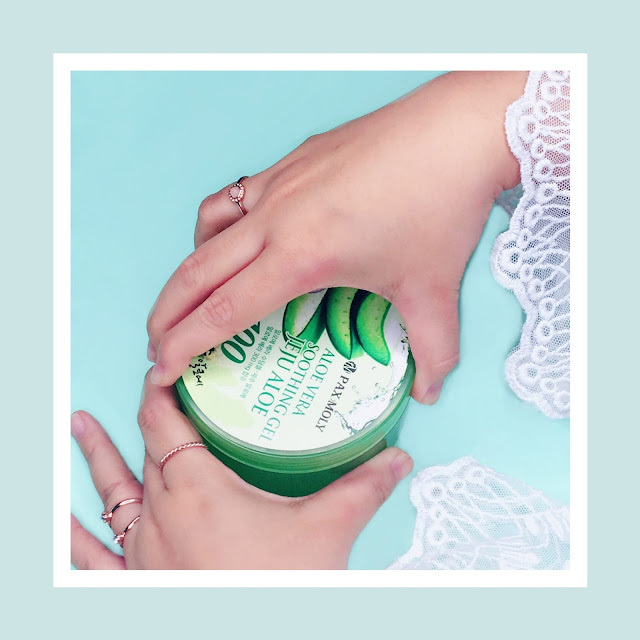 To my absolute joy, they decided to include their Aloe Vera Soothing Gel (Jeju Aloe) for us to try so I now have a new tub of aloe-goodness to play with! 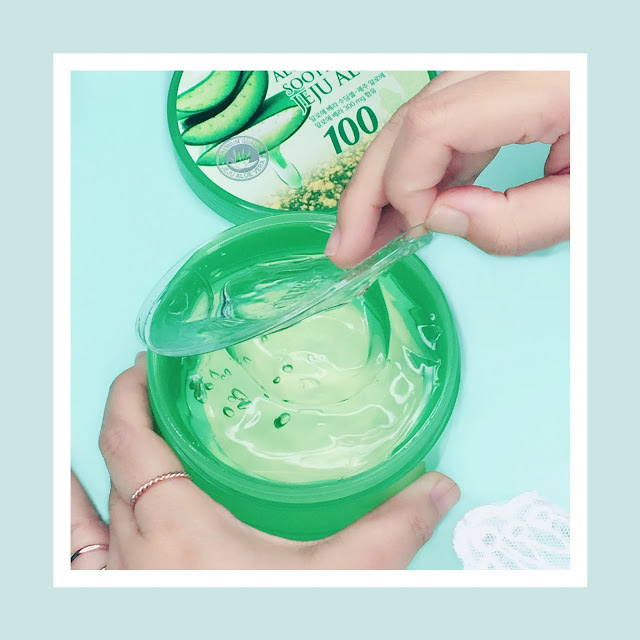 🙌 The product comes in a typical aloe vera gel tub packaging, weighing 300ml each. 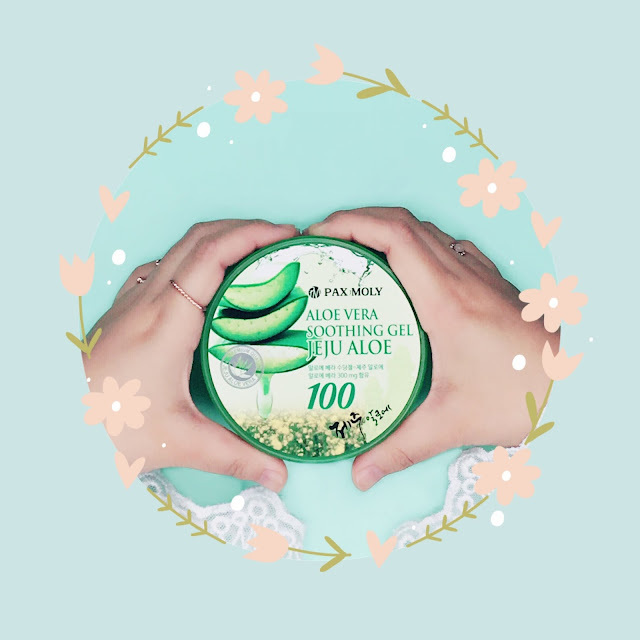 Made with Jeju aloe vera and Hyaluronic acid, it'll give your skin its much-needed hydration and soothe it at the same time. It has a slightly thinner consistency, more watery and absorbs fairly quicker than the Nature Republic Aloe Vera Gel. It contains no paraben, no artificial coloring, no mineral oil and no benzophenone. Ingredients: Water, Glycerin, Alcohol, Propylene Glycol, Carbomer, Triethanolamine, PEG-60, Hydrogenated Castor Oil, Aloe Barbadensis Leaf Extract, Camellia Sinesis Leaf Extract, Bambusa Vulgaris Extract, Chlorphenesin, Disodium EDTA, Phenoxyethanol, Fragrance. The most well-known use of an aloe vera gel is a sunburn remedy. Since summer is coming up, it would be good to stock up some at home. Apply a generous amount on the affected skin for instant relief. Extra tips: Refrigerate your aloe vera for extra cooling effect. You can use both on your face and body so there no hassle of buying separate products to treat your sunburned skin. The next basic way you can use an aloe vera gel is to treat your dry skin. 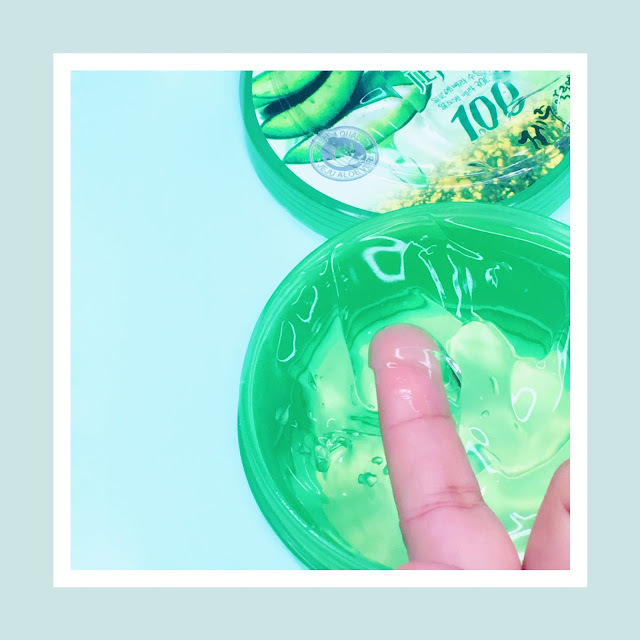 These aloe vera gel usually contain Hyaluronic acid which is an often used ingredient in skin care products made to combat dryness on the skin. With aloe vera, the natural moisturiser added in, this gel is perfect to use for your skin. I usually apply them on as a moisturiser in my skincare routine and as a quick moisture booster as well whenever needed especially when I am staying in an air conditioned room. You can always use the aloe vera gel as a sleeping pack as well. Just apply before you go to sleep to have that well-hydrated skin the next morning. An aloe vera gel is also great to be used on your hair and body. Since they're cheap and comes in a generous amount per tub; it's perfect to be used as a body moisturiser. Apply frequently on dry areas of your body such as the elbow, knee cap etc. For hair, you can use it as a conditioner or even as a hair gel. When my scalp feels itchy (due to dryness), I will apply some of the aloe vera gel to reduce the discomfort. Just make sure to wash your hair properly the next day to avoid accumulating dandruff from the dried gel residue. The other use of aloe vera gel that I often take advantage of is as a makeup base or primer. This way of usage is not as well known as the others but I found it a great method to make my makeup stays on long without getting cakey. I have a dry to normal skin type; putting an adequate amount of aloe vera gel on my face and letting it dry before applying on the next product is a great way to lock the moisture in. This way, my foundation become less patchy and my makeup last longer than usual. If your skin is experiencing irritation, rash or some sensitivity, you can try to apply a little amount of the aloe vera gel to a small part of irritated spot first to see if it'll help to reduce it. If your skin doesn't have any reaction to it, you can continue applying more to help reduce the irritation. Just make sure to stop using it if any reaction occur as individual skin condition may vary. I also learned from Eros (from fishmeatdie.com) that he occasionally uses the aloe vera gel to help reduce acne and pimples! Maybe you can try that as well if it'll work on you too. So, I hope these five tips will help! What are you waiting for now? Time to stock up on some aloe vera goodness *giggles* and let me know if these suggestions help! Aloe is love, aloe is life! Aloe gel is my #1 must have product too bc it helps my acne so much. Love the pics!